Mondays are my designated "full days" for shepherding, defined by (a) I take my lunch and (b) I don't transmit. As a consequence I have lots of time to think, or more accurately, to let my brain spin. For the past week or two, I've had a song on replay in my head: of all things, a choral version of Abraham Lincoln's Gettysburg Address, that I sang in my junior high school choir, lo, these many long years ago. Allowing it to spin (not that I seem able to stop it!) led me to thinking about war, and the huge waste of lives it incurs. Setting aside the vexed question of whether any war is justified in terms of the damage it does, Lincoln's words, "the brave men, living and dead, who struggled here, have consecrated it far beyond our poor power to add or detract", made me think, and try to feel, what it would be like to face the likelihood of death day after day, battle after battle, for young men who had not yet really had a chance to live. I have thought about facing death as one grows older, and that's hard enough to contemplate. What soldiers go through, on our behalf (justified conflict or not) is nearly unimaginable to those of us who have not experienced it. Lincoln's words brought this home to me a way I've never felt, or thought about, before. All in all, it was a lovely shepherding day--very peaceful both in terms of sheep movements and the weather. The forecast had an ominous note--snow possible above 700 m--but the day was sunny, breezy and at times nearly warm (well, it was when we were hunkered down behind the loading ramp in the yards, out of the wind but with the sun full on us). First, we had a sojourn in the lucerne, then another attempt at grazing the main yards. Again, it was less than successful. I think it is too small an area, the flow paths are too restricted, and frankly the quality of the feed is only mediocre, which everybody in the picture gets. So the flock is either moving quickly through the yards, not grazing, or standing around waiting for the few grazing out the front to get out of the way so the rest can have a chance. To be fair, they weren't all that excited about going into Curly Sedge from the yards, either, and none of the above caveats apply there. Maybe they were just filled up with lucerne and not interested in the more mundane "green stuff". After lunch we had a good graze up the Strip, and over into the Stud Paddock. 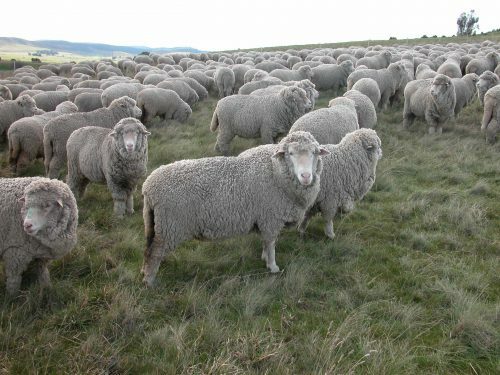 They were more or less willing to graze the bottom of the Stud Paddock, and when we left them had settled down in the sun on the west-facing hill. I imagine they may have been saying to each other, "Jeez, was she ever going to give us a rest stop??" Just in case you wondered… This is how I stay warm for winter shepherding: 4 layers on top, woollies and insulated pants, insulated boots, WGW cowl (my design headband, beanie and hoodie. The jacket and pants go back about 10 years, and are still going strong. Oh, and keeping moving helps! Skye kitty keeps my chair warm for when I get home. All of which helps me be brave when the forecast is for possible snow above 700 m.
P1: Motoring through the lucerne, into the wind. P2: Leo snuggling up to Clara. Having the green marks on their noses is helping me realise how often my specials are close by me, and each other. P3: See what I mean about the flow in the yards? The feed in the pens is being studiously ignored as they try to get past me. P4: Chance lying in a cloud of his undercoat that I just finished brushing off him. Janie thought the grooming was absolutely divine, but Chance just barely tolerated it. And, the “R” on my sock is not to help me remember right from left, only to distinguish which foot the sock goes on! P5: Ah. Another newly named sheep: Difficult Girl. She is ALWAYS at the back, and ALWAYS standing off the dogs. I’m going to keep her fleece this year. P6: And meet Difficult Boy–very often found in the same position and with the same attitude as Difficult Girl. If I get a chance to mark him, I’m keeping his fleece, too! P7: One of my favourite cabbage gums (eucalyptus pauciflora). It doesn’t look like much, but every year it sets an impressive amount of seed. Lots of my cabbage gum seedlings came from this tree. P8: These wonderful silhouettes are found beside the highway between Bagdad and my place–at least, I think this is the northernmost one. It marks what used to be called “Shell Corner”, where my road (the old highway) comes very close to the new highway. P9: Settling down for a well-deserved rest at about 3 pm.